Bathrooms are one of the most important features that affect guest satisfaction. It&apos;s also what people care about when deciding to book a hotel room. What could be better than relaxing in a tub of a luxurious bathroom and being overwhelmed with the fully-equipped bathroom amenities after a long flight? So here we round up with the list of hotel brands that offer exceptionally good products at their bathroom properties. As you already know, Estée Lauder’s leading organic line, Aveda stands out with its fresh, plant-infused scents. Its products have attracted both men and women. The line ensures a high-quality natural product free of silicone oils, petroleum products, artificial colors, no animal testing guarantee, and packaging from recycled materials. You can find them in all of Marriott’s 160 Renaissance Hotels. 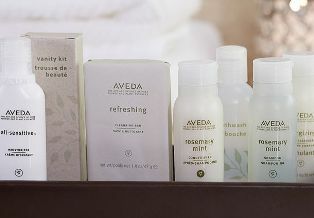 Guests can enjoy 1-ounce bottles of Aveda’s highlights including their scalp-tingling Rosemary Mint Shampoo and Conditioner, Energizing Body Cleanser, and their rich All Sensitive Moisturizer cream. Skincare is a priority at Meritage Collection Hotels. This hotel brand offers the high-end Fresh line of bath amenities. There you can find Fresh Hesperides Grapefruit Bath & Shower Gel, the potent formula infuses shea butter, citrus fruit extracts, with vitamins C and D to nourish and revitalize your skin. You can ask the front desk for a few extra bottles of the shower gel for the road. TRYP has up to over 120 properties and 17,000 rooms in Europe and the Americas. 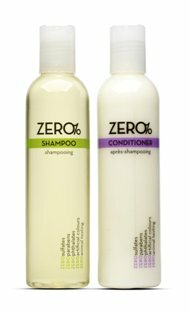 This hotel brand features the line’s Zero Percent Collection, a luxe, earth-friendly formulation named for its zero sulfates, parabens, phthalates, and artificial colors. Its emphasis is on a green stay, the shampoo, conditioner, and body washes. They are provided in refillable dispensers in the shower. If you want to bring a few samples of the sudsy amenities home, then, the front desk has some small bottles of the collection at their ready. Expect to find the Zero Percent Collection in nearly all TRYP properties with a few international travel exceptions. This is a standout hotel group. And its emphasis is also on a new age of skincare and cosmetics. 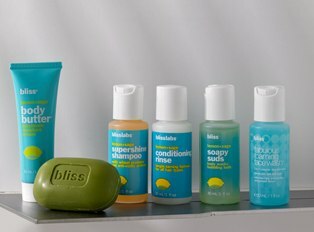 And Bliss products of beauty, bath, and body amenities were offered at W Hotels to help its customers recreate a spa experience at home. The sink side amenities roster is one of the greatest hits of Bliss. Products include Fabulous Foaming Face Wash, Lemon+Sage, Body Butter, Supershine Shampoo, Conditioning Rinse.